Augmented reality (AR) obtains increasing acceptance in the operating room. However, a meaningful augmentation of the surgical view with a 3D visualization of planning data which allows reliable comparisons of distances and spatial relations is still an open request. 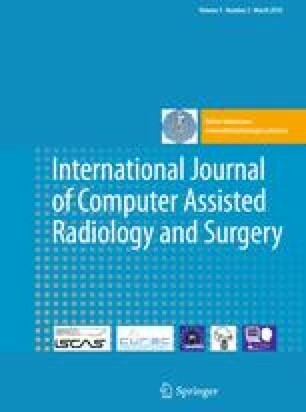 We introduce methods for intraoperative visualization of 3D planning models which extend illustrative rendering and AR techniques. We aim to reduce visual complexity of 3D planning models and accentuate spatial relations between relevant objects. The main contribution of our work is an advanced silhouette algorithm for 3D planning models (distance-encoding silhouettes) combined with procedural textures (distance-encoding surfaces). In addition, we present a method for illustrative visualization of resection surfaces. The developed algorithms have been embedded into a clinical prototype that has been evaluated in the operating room. To verify the expressiveness of our illustration methods, we performed a user study under controlled conditions. The study revealed a clear advantage in distance assessment with the proposed illustrative approach in comparison to classical rendering techniques. The presented illustration methods are beneficial for distance assessment in surgical AR. To increase the safety of interventions with the proposed approach, the reduction of inaccuracies in tracking and registration is a subject of our current research.